‘Mücver’ is the rather un-lovely Turkish word for courgette fritter (although, reading it now, I realise that ‘courgette-fritter’ is also a little un-delicious sounding). These things need a new name! (Zucchini popcorn? Not so catchy perhaps…). Anyway, the Lokanta Maya mücver were a bit of a sensation. Oftentimes in Greek and Turkish restaurants, you see these served as little patties, pressed flat on top and shallow fried. These always seem to have absorbed too much oil though, and can turn out a kind of drab brown-ish colour. The Maya mücver were deep-fried and as a result looked like golden little sputniks, with crispy bits of courgette sticking out at every angle. So, deep frying I entirely endorse. The only thing I would say, is that it is best to keep the balls on the small side as if over-large they can get a little doughy in the middle. In fact, slight doughy-ness is my only critique of the mücver served at Maya, so, in the recipe below, I’ve included chopped roasted walnuts to counteract this and change up the texture a bit. I tried making with and without walnuts– and with was much better... and don't worry if walnuts aren't your favourite thing, they really add more in the way of texture than flavour in this dish. Grate the courgettes into a sieve and sprinkle generously with salt. Position the sieve atop a bowl, and put aside for 30 minutes. The courgettes will begin losing water, which is what will help make a light crisp fritter. Meanwhile, make a start on the dipping sauce by doing the same thing with the cucumbers. Grate these (finely this time) into another sieve, sprinkle with salt, then position above a bowl to catch the drips, and set aside. Preheat the oven to 180˚C to roast the walnuts. Give these 8 minutes or so in the hot oven, but do keep a close eye as they can burn quite quickly. When the walnuts have cooled sufficiently, chop them into approximately 5mm chunks. Continue to prepare the dipping sauce by finely chopping the dill and mint. When the cucumber has been draining for 30 minutes, squeeze this by hand to remove as much water as possible. Place the Greek yogurt in a clean bowl and mix through the drained cucumber and chopped herbs. Squeeze in the lemon juice, and olive oil, then mix. Give this a quick taste before seasoning as, depending on how much salt went on the cucumbers, it may not need any more. Put the finished dip in the fridge to thicken. Squeeze the grated courgette by hand to remove as much water as possible. Place this in a large bowl and add the chopped shallots and herbs. Beat the eggs together briefly in a separate bowl, before adding to the courgette and mixing through. Sieve the flour and baking powder together into the courgette mix, then beat until everything comes together to form a batter. Lastly mix through the crumbled feta cheese and chopped walnuts. The mücver mix is now ready to deep fry! I like to use a small-ish saucepan for this kind of deep frying as you get the right depth of oil without having to use industrial quantities of the stuff. Fill to just over half with the canola or sunflower oil, and heat on high. To test the temperature of the oil, drop a small square of bread, or a tiny amount of the batter mix into the pot, if it is quickly swallowed by bubbles, the oil is ready to go. Using a fork, pick up a tablespoon-sized amount of the batter and lower this gently into the oil. I find that a fork is better than a spoon for this job as it creates fritters with a more free-form shape – i.e. more crunchy bits! Add another one or two forkfuls of batter, depending on the size of you pot. It is very important not to overcrowd as the oil will bubble up too high and may overflow. Overcrowding can also reduce the temperature of the oil so that the fritters don’t cook, or mean that they will end up touching one another and merging! Fry each fritter for a couple of minutes or until golden brown, turning gently during the frying with a clean, dry fork. Place the cooked fritters onto kitchen roll to drain. If you are making a large amount, consider keeping these in a warm in the oven at about 80˚C while you finish frying. Serve the crispy mücver immediately (they are definitely at their best fresh from the oil and hot), with the minty yogurt dipping sauce alongside. The Qatar fish market is somewhere I have been meaning to go for a while now but had been deferring due to 40+˚C temperatures (and, in particular, the likely olfactory consequences of these). Early October now, the weather back into the (mild?) mid-30s, and an octopus to find, it seemed like the time was finally right... so, Friday morning, with little idea what to expect, off I went. Lastly, to challenge 2), goriest, but also most easily resolved. Cut a slit in the centre underside of the octopus and remove the beak, as well as the hard cartilaginous ball inside, along with any other remaining head contents not already removed by your fishmonger. Start by mixing the water and wine, bringing these to a boil in a very large saucepan. Using the back of a large knife, bruise each garlic clove slightly. Add the garlic, as well as the herbs, and a good sprinkle of salt to the pot of boiling liquid. Place the octopus in the pot, and wait for the liquid to come back to the boil. Cook for 5 minutes, before lowering the heat to the lowest possible setting. A slow simmer is perfect. Four hours was the official recommendation I know, (maybe their octopus was bigger), because judicious checking determined that 2½ was enough for my particular octopus to have reached optimum tenderness. Too much cooking and chances are it will lose its texture entirely. I recommend monitoring the situation from the 2-hour mark by removing a small amount of tentacle using scissors and a pair of tongs. On a chopping board, slice the octopus to gauge the texture with a knife. Or if you are OK with tasting a bit of boiled octopus, pop a piece in your mouth – it's the best way to tell! 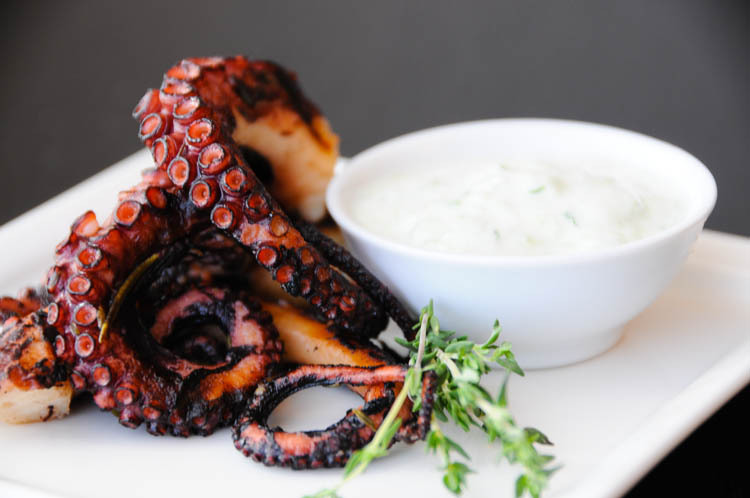 Remove the octopus from the liquid when cooked and allow to cool before refrigerating for 3 hours. (I don’t know why this helps the texture situation in strict food chemistry terms, but trial and error tells me that it does!). Finally, heat a large griddle pan (or, even better, a BBQ) to high. Cut the tentacles of the octopus into serving sized pieces, max. 5-6cm long, and sprinkle all over with of olive oil and salt. When hot, place the tentacles onto the griddle, turning as you cook to achieve an all-over char – 10 minutes should be sufficient, but feel free to blacken to your particular taste. To serve, arrange artfully; drizzle with olive oil, and perhaps scatter a little more salt; place some thyme sprigs to garnish, and make sure some cacik yogurt sauce is in easy reach for dipping! Halve the figs, cutting vertically from the stem to the base. 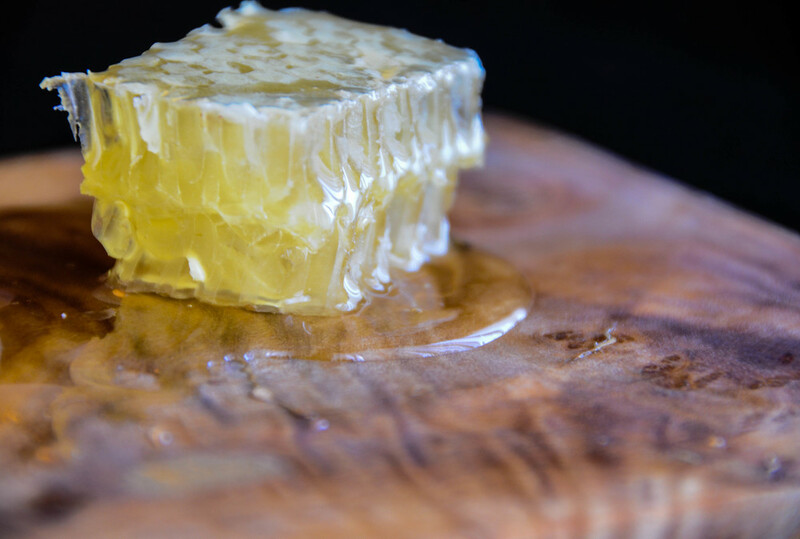 In a small mug, mix the honey with a few tablespoons of boiling water to get it to a thin, pourable consistency. Place two non-stick frying pans on the stove-top - a larger one for the halloumi and a smaller one for the figs. Over a medium heat, heat a very small amount of olive oil (a teaspoon or so) in the smaller pan. Using a scrunched-up piece of kitchen roll, distribute the oil thinly across the base of the pan. Place the figs, cut side down into the pan, cooking for two minutes or so on the cut side, before turning over to cook on the skin side for another minute or so. Now, splash in the thinned honey. This should erupt into lots of bubbles and momentarily envelope the figs. Turn the heat to low and add the cinnamon sticks. Gently turn the figs over occasionally and baste with the honey mixture while you get on with cooking the halloumi. Oil the larger frying pan similarly to the first, spreading again with kitchen towel to achieve a thin cover. Place this over medium-high heat and fry the halloumi slices for a few minutes on each side, turning carefully with a spatula until golden in colour. When the halloumi is nearly ready, turn the heat up to medium under the figs, splash in the balsamic vinegar, and continue to reduce for two minutes or so more. (The honey-balsamic combination should have a syrup or glaze-like consistency at this point). Serve the halloumi and figs together as soon as the halloumi is cooked, pouring the glaze over both, (halloumi does not like to go cold!). To garnish, top with a cinnamon stick or two, some mint leaves, and a scattering of the crushed pink peppercorns. My first taste of smoked mackerel together with beetroot was a quite a few years ago now, at a gorgeous little boutique B&B in Norfolk called Strattons. We used to drive up there from London occasionally, for the peace and quiet, and for their lovely little restaurant, where, for £1 (donated to charity) you could purchase any of the recipes on the restaurant menu. This is such a fantastic idea, a great way to raise money for charity, but also a way to get diners more involved in and excited about their dinner – I really don’t know why more restaurants don’t do it. Anyway, they had a lovely salad of raw grated carrot, beetroot, and smoked mackerel, which I duly purchased the recipe for and used to make at home occasionally, mainly for the earthy flavour of the raw beetroot, (and for the fun of having a way to eat something as beautiful as a beetroot raw). I was reminded of the Strattons salad at Lokanta Maya by a dish of beetroot couscous and smoked sea bream. Back in London, I would have been keen to try bream smoking at home, fussing around to get some decent wood chips and setting up a little smoker in the garden; in Qatar, I set off the hotel-apartment smoke alarm blowing out a tea-light the other day. And when this happened, hotel staff stormed the room with fire-extinguishers, evacuation procedures were initiated, and the noise continued to sound for several deafening minutes after the ‘just-a-tea-light’ all clear had been given. So, I can’t smoke bream. I can offer an apartment-dwellers lite version though by following the Strattons example and using (store-bought) smoked mackerel instead. In order to take the whole dish in a more Middle-Eastern direction, I’ve also added roast sliced slivered almonds, and juicy little segments of lemon to the couscous. These are designed to pop in the mouth and give occasional little citrusy bursts of flavour. Texturally, the almonds and lemon bits also really help break the couscous monotony! If you fancy the idea of the beetroot couscous, but not the mackerel so much, a vegetarian version might involve topping with a bit of lightly grilled feta instead. Or even just crumbling with some nice feta to create more of a salad. I made a rather ambitious quantity of this couscous last week, and ended up eating the left-overs with crumbled feta and a drizzle of the cacik yogurt two days running. Yum (but then leftovers always taste better!). In an oven pre-heated to 180˚C, roast the slivered almond slices for 5 minutes, removing when they have just began to colour, (take care as these to tend to burn in an instant). Peel the beetroot and, using a fine grater, grate this into a large bowl. Add the dry couscous, and the crushed half garlic clove to the grated beetroot, mixing through. Pour over the boiling water, place a plate over the bowl, and set aside while the couscous absorbs the water. After about 5 minutes, lift off the plate and fluff the couscous mixture using a fork. Set aside to cool for a while. Using a paring knife, remove the skin and zest from one lemon. Cut carefully between the membranous sections of the peeled lemon to free wedge-shaped chunks of lemon leaving the dividing membrane behind. Then, and this step is kind of fiddly, peel off the mini-capsules of lemon flesh in groupings as small as possible. Individual capsules of lemon are ideal (! ), but not always easily achieved I know. Do this until you have a few tablespoons worth of lemon segments, (or until you begin to get fed up). Add these to the couscous, along with the squeezed juice of the second lemon. Splash in a quick glug of olive oil and mix this through as well. Add salt and pepper to taste. Tear the smoked mackerel into bite-sized chunks, seasoning these with a little additional lemon juice. Smoked fish, raw beetroot, crunchy almond, and not a peep from the fire alarm! This is not so much a recipe as a strange combination of ingredients that I think works kinda nicely as a palate cleanser amongst the heavier mezze. It didn’t feature in the Maya meal, but, looking at the other dishes, I thought that something very fresh might work well with. Halve the melon using a large knife. Carve out rounds using a melon baller, sprinkling these with a little lemon juice before placing in a bowl. Cut the cheese into uniform 1cm cubes. Add these to the melon. Cut the mint leaves finely into lengthways strips - so from stem to tip. (This just looks a little more elegant in the finished dish that the usual crossways cuts I think). 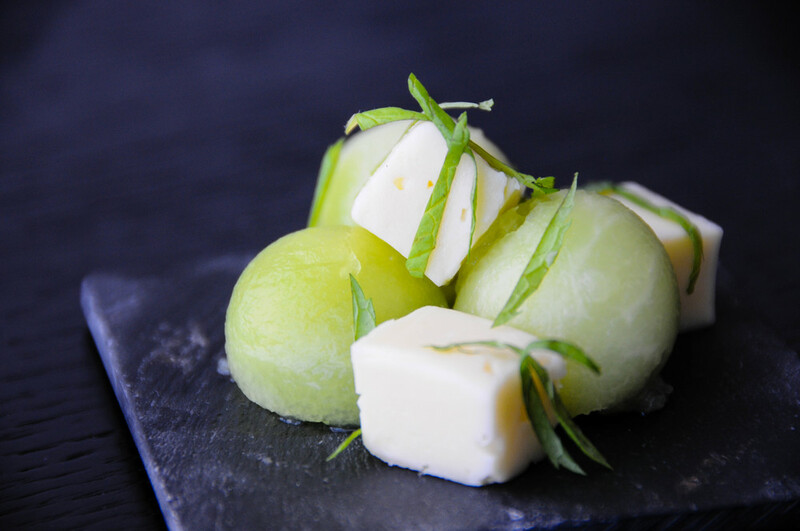 Mix the majority of mint in with the melon balls and cheese cubes. To serve, assemble in some kind of geometrically aesthetic way, and scatter the last mint leaves on top... Voila! I hope that you’ve enjoyed reading about my little experimentations with modern Turkish food, and are inspired to give one or two things a go. If you are very enthused though, and want to give everything a go at once, I’d definitely recommend involving a friend (or two). A fun idea alternative to bring-a-plate I think, to have people come around and be tasked with preparing one little mezze dish (especially if some of the more involved prep work for each may have kindly (& surreptitiously) been done ahead of time! ).